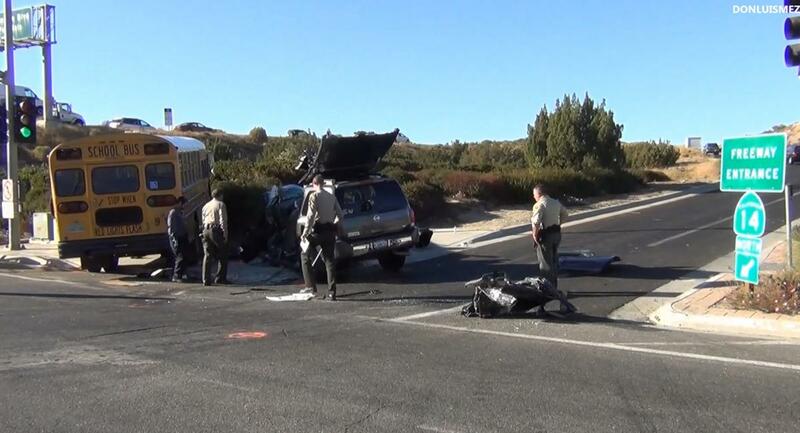 PALMDALE – Four people were taken to the hospital Wednesday afternoon after a sport utility vehicle collided with a school bus in Palmdale, authorities said. The crash happened around 2:30 p.m. on Avenue S at the northbound 14 Freeway on ramp, according to Palmdale Station Traffic Deputy Arens. Fortunately, the Antelope Valley Schools Transportation Agency bus was not occupied by children at the time. There were four people in the SUV, Arens said. The SUV driver reportedly had to be extricated from the vehicle and suffered serious injuries. His passengers suffered minor injuries. “Everybody got transported to the hospital and it appears that most people are doing okay,” Arens said. Traffic in the area slowed, and the freeway on-ramp was closed for more than two hours while crews cleared the vehicles from the scene. 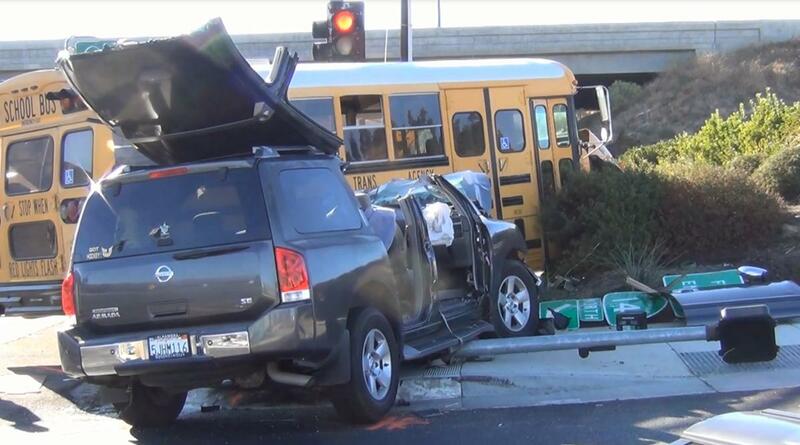 20 comments for "School bus collides with SUV"
does any one know if the driver is okay? i drove by this accident right after it happened and wasn’t able to stop to help. but the driver looked hurt and i’d really like to know if anyone has heard about his status. He sustained significant injuries, and has been listed in critical condition. He has a had a couple of surgeries, which went well, and we are very hopeful that he will make a full recovery. Thank you for your concern, I know the family appreciates it. I heard it was really Cthulu driving the bus. I don’t know who was driving the bus. But I do know the family and it is untrue about any “relationship” between the SUV drive and “another woman”. FYI, the woman was the mother of the driver and his little sister was another passanger. My thoughts and prayers go out to this wonderful family as they need it in this difficult time. So Gladys please keep your thoughts to yourself! This is utterly appalling that you are making a joke about this — the driver of the SUV is a delightful and responsible young man who is working hard in school, getting excellent grades, and is an all around wonderful kid. I’ve known him and his family for many years and what has happened to them is horrible, and not even remotely a joking matter. Get a Grip? Are you for real? You make a completely inaccurate and derogatory post about a critically injured young man, about whom you know nothing, and I should get a grip because I find your comments unacceptable? I think you are the one who needs to get more than just a grip. Dang! That thing is a convertible! Never seen that in a SUV. So who is responsible here, the bus operator? or the usv driver. Chances are, since the bus driver made a left-hand turn in front of the SUV, it is the bus driver’s fault. Not sure when they are going to actually just put a dedicated turn signal there. There have been tons of accidents there over the past couple years…. everytime in the same exact spot. Agree, They need dedicated turn signal there. Ave S near freeway is a vary busy street and needed to be made safer. I agree. The Westbound side of Ave S at the 14 has a dedicated turn signal, why doesnt’ the Eastbound side that turns North onto the 14? There is far more traffic heading Westbound at this intersection, which makes it nearly impossible to be able to turn left onto the highway to go North into Palmdale. On a related note, where is the yield sign at this same spot for traffic turning to go North on the 14 into Palmdale? Traffic turning right from the Westbound side and traffic turning left from the Eastbound side end up in accidents often there because there isn’t a yield sign to know who has the right of way. We see terrible accidents at this intersection all the time. City engineers need to review the light system and perhaps remove the lights and place an old fashion stop sign. So scary.